Here’s an Easter Bunny to make from pompoms, craft foam and chenille stems. He’s hanging around a small grapevine twig wreath – so you need one of those too! 1. 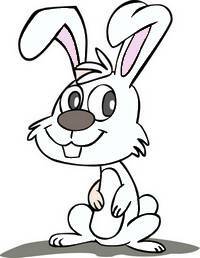 You may have to enlarge the pattern for the bunny’s feet and hands. Print and cut out the pattern pieces, then trace them onto white felt. Cut out two feet and two hands. 2. Cut the bumpy chenille stem so that there are two bumps on the stem. Fold the stem in half so that the two bumps are together and the folded part of the stem is at the top. Cut a piece of the pink chenille stem, about the length of the bumpy stem. Glue in the center of the two bumpy stem ears. Make another to complete the two ears. 3. On the 2 inch pompom, which is the bunny’s head, glue the two tan or grey pompoms, placing them together for the cheeks. You can also use white, but I thought that it would be hard to see. 6. Glue the two ears on top of the 2 inch pompom and now glue the head to the bottom inside area of the wreath. 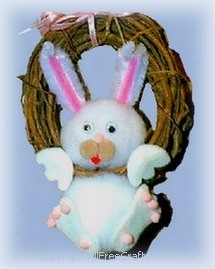 You will also need to glue the ears to the wreath because the bunny’s head is a little top heavy. 7. Glue the other 2 inch pompom on the bottom of the wreath. Glue the medium white pompom to the back of the bottom 2 inch pompom for his tail. 8. Now glue the two hands on the wreath next to the head and the body. 9. Glue the tiny pink pompoms onto the felt feet, three for the toes and one for the heel. Do the same for the other fot and glue them to the body, as shown in the picture. 10. It’s hard to see in the picture, but I made a thin ribbon bow and attached it to the top of the wreath with a loop for hanging. I had a lot of fun making this bunny – and he turned out so cute that I brought him into work, at AC Moore. The manager hung the bunny up in the store so that others could make him. I hope your bunny turns out well for you!